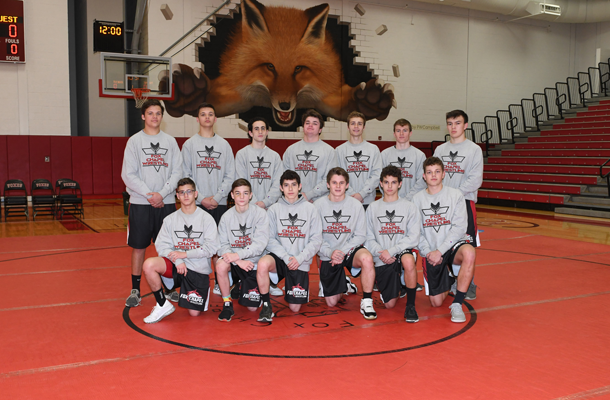 The days can be long and the workouts can be grueling, but for 13 members of the Foxes’ wrestling team, their status as multisport athletes has been a very positive experience and one that they highly recommend. It’s also a practice that their coach, Ron Frank, wholeheartedly supports for many reasons. Three of the wrestling team’s most successful multisports scholar athletes are senior Avery Bursick and juniors Eddie Farrell and Alex Wecht. They say the diversity makes them better leaders, helps them to develop more self confidence and self discipline, and has improved their overall athletic abilities. The same holds true for 10 other multisport wrestlers: Steve Cano, Joey D’Cunha, Henry Gavassi, Zane Gavassi, Brendan Kost, Josh Miller, Jose Morales, James Patterson, Ray Worsen, and Sam Zukerman. Avery first started wrestling and running cross country and track when he was in middle school. He’s found the transition from sport to sport to be pretty seamless. 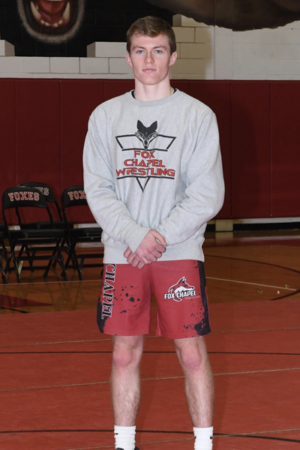 After being voted as “most inspirational” by his cross country teammates this fall, Avery moved on to wrestling season and has had some impressive performances so far this year. Avery’s victories continued his momentum from last season when the four-year starter won 22 matches. He also has advanced twice to the WPIAL Class AAA wrestling championships. A lot of football coaches say would love nothing more than to get as many players as possible from wrestling squads. There is so much that transfers between the two sports and coaches like wrestlers’ discipline, mental toughness, and attitude. Eddie and Alex play football as well as wrestle. They are known for their dedication to strength training and have the distinction of being the two strongest athletes currently enrolled in school’s strength and conditioning program. They say most people think of football as the most physically demanding of all sports, but they believe the wrestling workouts and competitions are much tougher and more intense. Eddie returns to the wrestling team this year after posting 21 wins last year. This season has gotten off to a positive start for him too. At the preseason Hampton Dawg Duals Tournament, he won four of his matches, and the only reason he didn’t come away with a fifth win was because he was bumped up to the heavyweight category. His opponent outweighed him by a good 30 pounds. On the football field, Alex made a huge impact this season in his first year as a starter. His contributions earned him honorable mention as a defensive back by the Big 56. Even with his success on the field, the 5’10” member of the National Honor Society admits he prefers wrestling and even looks forward to their Saturday workouts! 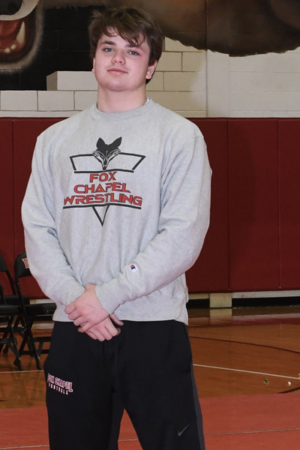 Alex is the Foxes’ starter in the 160-lb. weight class this season, up from last year when he bounced between the 145-lb. and 152-lb. positions. 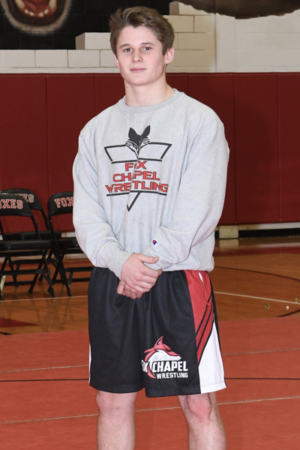 In his sophomore year, Alex won 16 matches and medaled at the prestigious Allegheny County High School Wrestling Tournament. If things work out as he would like, Alex would like to wrestling in college, but that desire is secondary to his top priority – academics. While every student athlete is not destined to play in college, many esteemed coaches at the higher levels, including Upper St. Clair native Kirk Ferentz, the respected longtime head football coach at the University of Iowa, say they look for all-around athletic kids when they are recruiting. In fact, a recent NCAA study that showed some 88 percent of Division I male athletes and 83 percent of women’s athletes were multisport athletes during their teenage years. But even if an athlete’s participation in organized sports goes no further than high school, Coach Frank is a proponent of trying many sports and activities during those four years.